View of the DTLA skyline from Debs Park. Below: another view from the park, taken at sunset. Photo: Anna Chen/Metro. Welcome back to another installment of Fitness Fridays, where we feature various ways you can combine transit and fitness. 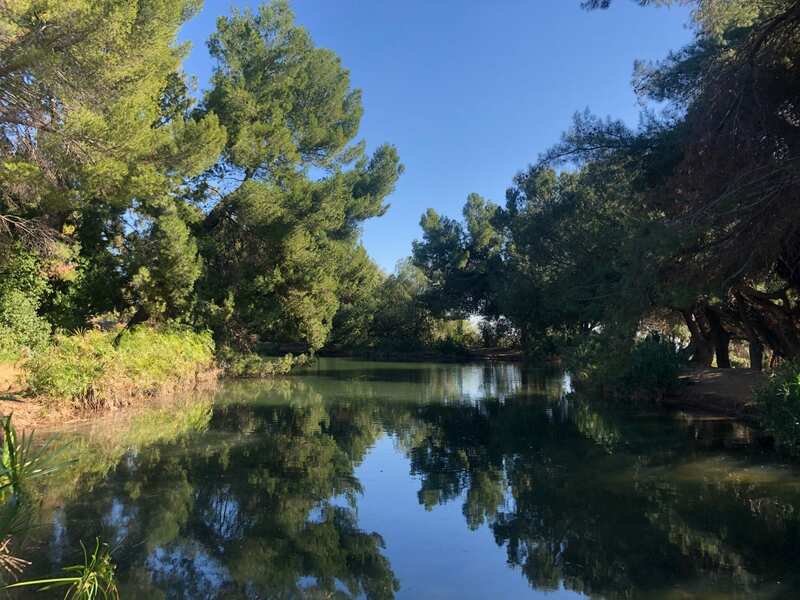 In this post, we head to Ernest E. Debs Regional Park via the Gold Line. Debs Park is located just northeast of downtown L.A. The main trail is approximately a five-mile loop that is pretty quiet — unlike the more popular hiking trails in Hollywood, you won’t encounter crowds of hikers. The trail is wide and well marked, and while there are some steep sections, overall I’d say it’s easy. Perhaps moderate if you try some of the shortcuts. Debs Lake. Photo: Giselle Gudino/Metro. Near the top of the trail is Debs Lake, a quiet little place that’s great for birdwatching and peaceful contemplation. In fact, the whole park is great if you’re a birder. More than 140 species of birds have been spotted in the hills, and the Audubon Center at Debs Park can give you tips on the best places to spot them! To get to Debs Park, take the Gold Line to Southwest Museum Station, then walk north on Figueroa toward Sycamore Grove Park. There’s a pedestrian bridge there that crosses the Arroyo Seco Parkway. Once you exit the bridge, turn right on Ave 52 and you’ll see the crosswalk that leads into the park. The entire walk is fairly comfortable and takes about 15 minutes. In fact, on the day we made the trip we ran into a group of high school birders taking this exact route! So you’ll be in good company. The Arroyo Seco Bike Path ends near Sycamore Grove Park, so you could also bike to the trail from Hermon and/or South Pasadena. As for bus options, Metro Bus 252 stops nearby on Via Marisol, and Metro Bus 81 stops nearby on Figueroa. If you have a recommendation for a place we should feature, leave it in the comments! 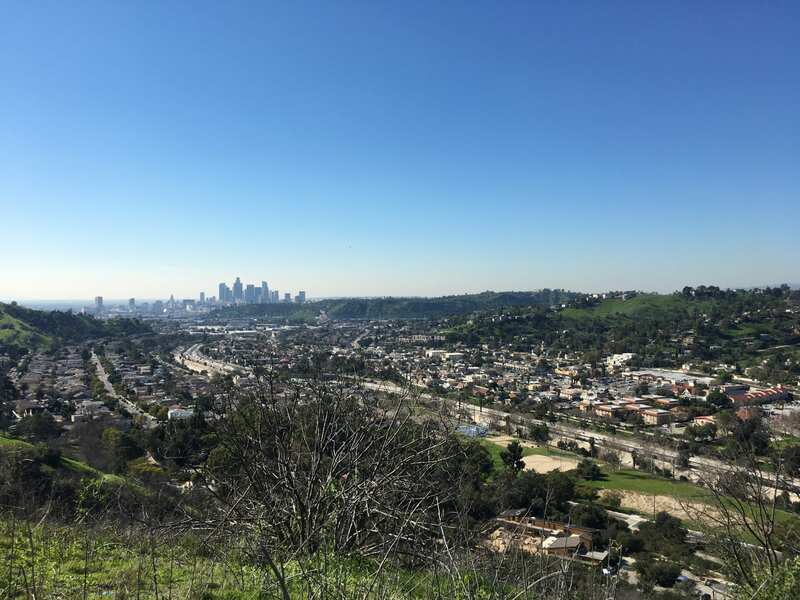 One of the very best views of DTLA is from the large park (State Recreational Area, with a lake and hiking trails) atop the Baldwin Hills that is named after the late county supervisor Kenneth Hahn. 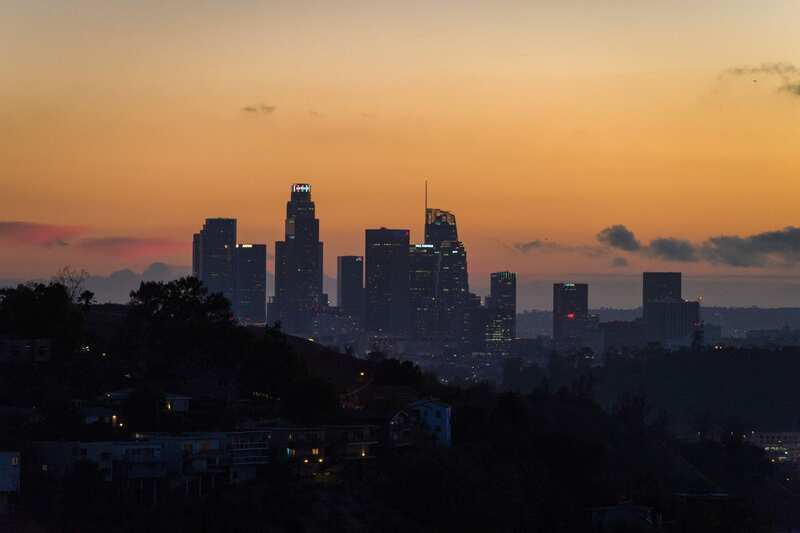 This vantage point provides the benefit of a significant elevation advantage, and a view of DTLA from the south-west, and thus is the very best location for afternoon/evening viewing of the DTLA skyline silhouetted against the beautiful San Gabriel Mountains. It is deeply ironic that several years ago Metro decided to eliminate its former, very convenient transit connection (via Metro bus line 217 along La Cienega) to that same (very large) park and viewing area. True, certain Line 217 buses continue to provide passenger carriage along La Cienega Blvd. between the Jefferson Expo-Line station and Fox Hills mall–running DIRECTLY past the main entrance to the park–but Metro, in its wisdom (? ), cut out those former, very convenient, northbound and southbound stops at the main vehicular entrance to the park/recreation area. Consequently, to reach Hahn SRA, Metro passengers now must take a dangerous hike adjacent to high-speed traffic lanes on La Cienega, either uphill from the Line 217 stop at Rodeo Road to the north, or from the Slauson Blvd. stop to the south.